Buick's new drivetrain technology for all-wheel-drive vehicles includes "magic magnets" to anticipate slippage before it happens, giving greater responsiveness to the all-new Encore crossover. If you feel extra-attracted to the all-new Buick Encore, it could be more than just its styling. 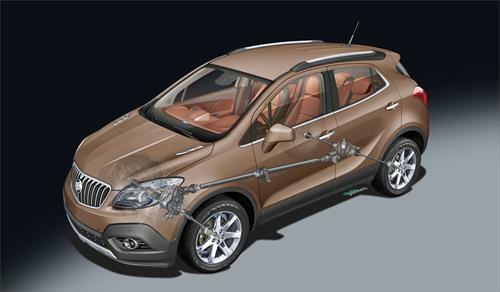 Buick has incorporated magic magnets into the AWD system of the 2013 Encore small crossover. An integral part of the Active On-Demand AWD system, the magnets are used to anticipate slippage before it happens, making the system proactive rather than reactive. Traditional systems usually engage all four wheels when they sense that one or more tires are slipping, reacting to the situation to provide more traction. In Buick's new Active system, however, a magnetic charge engages a clutch on the rear axle when the vehicle is at rest (not actively powering the wheels) as that is when slippage is most likely to occur. This preemptively keeps slips from happening and, if none occur as the vehicle begins moving, the system automatically disengages the AWD and returns to its normal front-wheel-drive operation. Engineers at Buick worked with BorgWarner to develop a more compact coupling for the rear axle to reduce the Encore's size and weight while retaining full AWD capability. This is one of many things Buick engineers did to achieve a 23 MPG city and 30 MPG highway rating for the Encore. The upcoming Encore will feature the new Active On-Demand technology, which will also appear in future AWD systems for the Enclave and LaCrosse V-6 sedan. Now that's attractive.